Thismonth's adventure with RoadAbode is in Chester County, at the KOA of WestChester. Not sure if this is really West Chester, but we are in the Brandywine Valley, home to horse farms, the Wyeth Family, the Duponts, and mushrooms. Usually when we vist this area we stop in to see Longwood Gardens, but this time we actually came to visit the KOA. E wanted to go canoeing again, and this time A and K wanted to give it a try as well. The KOA has a small rental fleet of canoes, and the Brandywine that it borders is slow moving with shallow water to give them a safe and relatively easy taste of paddling slow water. We left Friday Night after a full day at work or school for each of us. Drive down was mostly painless, just a bit slow on the blue route (476) after exit 9 for Route 3, and right before Route 1 passes thru Ridley Park area. We arrived at the KOA by 8:30pm, and were escorted to our site. The Campground's (or "Kampground" in KOA parlance) office and activity center are beautiful, as is the pool and newer looking cabins (kabins). The roads and sites themselves, however, could use some more gravel or paving. Still, the campground has a nice setup, with a central location to what we wanted to do. Our evening was taken with leveling and setting up the basics, and getting Friday Nite Pizza going. After dinner, we enjoyed a little cable then off to bed. Fell to sleep to the sound of a light rain on RoadAbode's roof. Everybody slept in for the morning (except A and Molly) and we got a late start. Had a great breakfast of eggs and sausage to start the day, then got cleaned up and dressed. Most of the morning it drizzled or rained on and off. Once the weather broke, we took a walk around to check out the surroundings. Even with a decently steady rain, the Brandywine seemed fine for canoeing. First though, we wanted the sun to come out and warm things a bit. 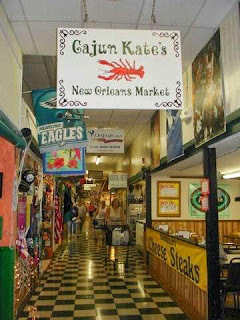 We headed out to a place I've wanted to hit for some time, Cajun Kates. Voted both Best of Philly and Delaware County for 2009 for Cajun food, is a small counter front resturant in Booth's Corner Farmers Market in Boothwyn PA. Turns out this place is as much a draw as the food at Cajun Kates. About 40 minutes away from the campground, the time passed quickly as we passed the horse farms and the girls sang their favorite tunes - acapella. The farmers market was filled with a mix of dry goods, Amish meats, candy counters, baked goods, vegetables stands, antiques. If you couldn't find it here - you may not need it! After wandering around and buying a few things, we found Cajin Kates. Only 6 stools in front of a small, almost inconspicuous stand. Behind the counter four guys filling orders as fast as they come, with a frenzy of customers coming to pickup pre-ordered meals, or jumping onto a stool as soon as it's vacated. We ordered Jambalya, and Crispy Cajun Mac & Cheese with Crab & Andouille Sausage to go. We also got two "gator on a stick" to sample on the way home. After getting the prize I came for, we set off toward home base. The gator was basically a sausage speared on a stick . more greasy than expected, but spicy and delicious. Worth the ride for sure! The girls liked it also, but not as much as I did. Once back, we took Molly out for a walk, and headed to the office to start our Canoeing adventure. Once we got our life jackets and paddles, we walked down the hill to the river. I gave a little lesson on how to steer, then sent K & E off to paddle upstream, while I setup A and myself at the launch. The girls needed a little more instruction on how to paddle and keep pointing where you want to go. While doing this, my wallet and phone (together in a zip lock bag) ended up missing. Looking downstream, about 50 yards we saw something plastic shine in the water. We turned and headed toward, and sure enough, it was my package of important items that had slipped out of my pocket. Blessed break! We turned back and headed back to the girls and continued on our explore. The water was very clear, and the girls were excited to see some catfish swimming by. We had this part of the river to ourselves, as we past railway, old horse farms, and palatial McMansions, all sharing the banks of the Brandywine. Before we knew it, it was time to turn and head back. No one fell in, no one got overly wet, and all enjoyed the ride. They all want to try something a little longer next time - perhaps like Wading Pines in the NJ Pine Barrens. We returned our rented gear, picked up some firewood for later, then went back to RoadAbode and took Molly on her own explore. Met a few other dog owners and chatted a bit. Then back to RoadAbode and warmed up our selections from Cajun Kates. Great Jambalaya and the mac and cheese was like none I've had before. Another great meal. Topped it all off with ice cream from the campground, and then a fire to bring in a beautiful sunset. Saw a line of over 50 geese fly ovehead as the stars started to show - quite a sight! Met Baily the Golden Retriever - Who get's around on four wheels - lost a leg to cancer Very friendly and walked over to meet us. Soon the temperature was dropping it got cooler, and the girls headed in to enjoy some of Mike Rowe's adventures on the Discovery Channel. A cup of coffee, some snacks, and checking on here brings an end to the day.